100th birthday wishes mark a major milestone — even heads of state, from Queens and Kings to Presidents and Prime Ministers, get into the act and send birthday messages to 100 year olds. The birthday greetings here do great honor to this uniquely amazing occasion. If you're looking for 100th birthday messages that celebrate the life of our greatest treasures, you've come to the right place. To me, there's something magical about the people reaching this milestone. They are truly incredible in more ways I could ever list on this page. Therefore, this section is reserved only for birthday messages that respectfully and lovingly sing the praises of 100 year olds everywhere. See for yourself. Wishing the best of birthdays to the best 100 year old I know. Happy 80th birthday for the 20th time. Happy 100th birthday! This is an incredible milestone, but not nearly as incredible as you are. Happy 100th birthday! 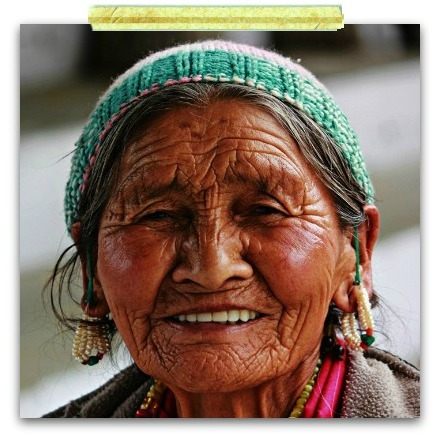 If we just get better with age, you must be nearly perfect. Happy 100th birthday! With 100 candles on your birthday cake, I can honestly say that your celebration was the brightest part of my day! Happy 100th birthday! With 100 years of priceless moments under your belt, your heart must be full of joy. You deserve every precious memory. Turning 100 is THE biggest milestone birthday. You want to go all out with your 100th birthday wish. The best birthday message for a 100 year old is something thoughtful that celebrates and honors his or her amazing life, plus expresses how you feel about him or her. Choose one of the 100th birthday wishes on this page (or from the next two pages) that best reflects how you feel about the birthday boy or girl. With other milestones, I typically point out that the recipient's personality should also be taken into consideration, but this factor is not as important here. With 100th birthday messages, you simply want to find the most suitable tribute. By suitable, I mean the "message closest to how you want to honor your loved one." It's that easy! 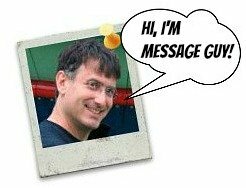 If you don't know how you want to pay tribute to the birthday boy or girl, just choose a birthday greeting from this section and, if need be, add your own personal touch to it. That should result in an appropriate tribute for this incredible milestone. For your 100th, I wish you the happiest, healthiest, sweetest, luckiest, tastiest, brightest, sunniest and best of birthdays. You are truly blessed — you have lived 100 years and have 10 decades of great memories. Happy 100th birthday! Happy 100th birthday! This is when you say to the world, "I've done my part," and the fun begins. You deserve only the best. You don't look your age at all. What are you...90? 95? 99? I think you can get away with robbing the cradle. I think it's time to get yourself an 80-year-old hottie. 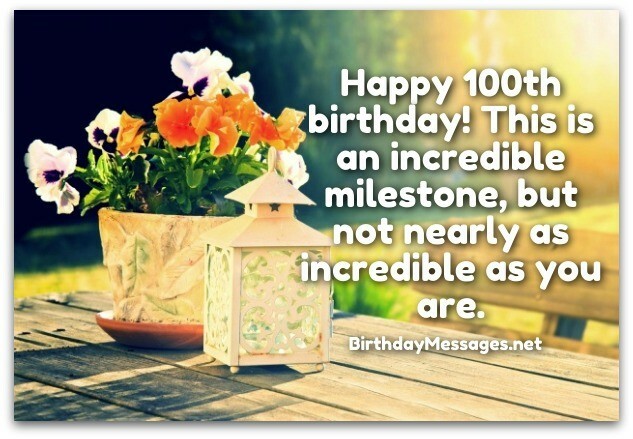 Hoping you only experience an abundance of happiness, wonder and health on your 100th birthday. You've certainly earned it. It isn't every day day somebody turns a century old. I'm so glad you are one of the lucky few. It's such a blessing to have you in my life. Happy 100th birthday! I love you. I chose the wish below for obvious reasons. Not obvious to you? This is one of my top picks because it cleverly pays tribute to the strength, love, individuality and achievements of someone who has turned 100, someone who deserves our deepest respect and love. Welcome to the centenarian club. Very few people get into this exclusive group. For most, the initiation fee is just too steep. I always knew you were unique. You've always stood out in my life. Happy 100th birthday! Keep searching for the right message! To me, you're 10 decades young. When I look at you, I don't see a 100 year old. I see someone who inspires me to love every trial and tribulation of life. You shouldn't only be congratulated for reaching 100, an amazing milestone in itself. You should be praised for the love, caring and wisdom you've given so generously every day for 100 years. Happy 100th birthday! May your special day be filled with sunshine, smiles, laughter and love...exactly what you've brought the world for 10 decades. Have a very happy 100th birthday. Many heads of state will send 100th birthday wishes to one of your loved ones upon your request. Below are the heads of state who have online forms for making your request. Get a 100th birthday message from the President of the United States through one of your Senators. Get a 100th birthday message from the President of the United States through one of your Representatives. Get a 100th birthday message from Her Majesty Queen Elizabeth II. Get a 100th birthday message from the Governor General of Canada. Get a 100th birthday message from the Prime Minister of Canada. Get a 100th birthday message from the Governor General of Australia. Get a 100th birthday message from the Prime Minister of Australia. Get a 100th birthday message from the President of Ireland. Get a 100th birthday message from the Governor General of New Zealand. 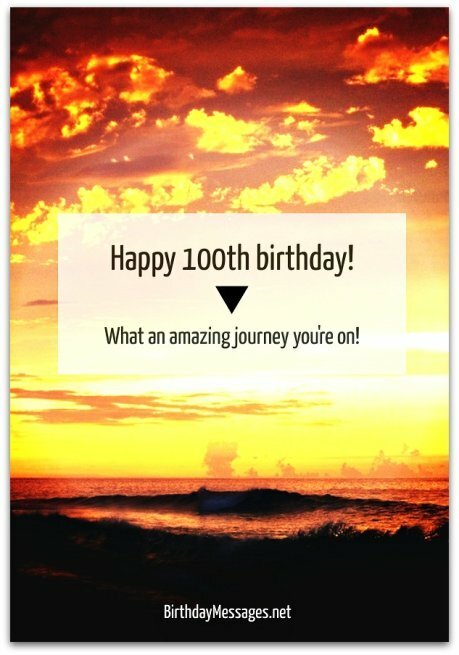 Get a 100th birthday message from the Prime Minister of New Zealand. Go ahead! It’s so easy to request a 100th birthday wish! Besides, the special 100 year old in your life will truly appreciate receiving this type of message from your head of state. May every minute of your 100th birthday be filled with the immense joy you've shared with your loved ones for 100 years. Happy birthday! Wishing you many more years of good health, overwhelming happiness, amazing grace and perfect peace of mind. Happy 100th birthday! You're a very special person, and not just because you've lived 100 years. Mostly, you're special because, whether you've faced bad or good times, you have always been a loving presence and kind hand for everyone around you. 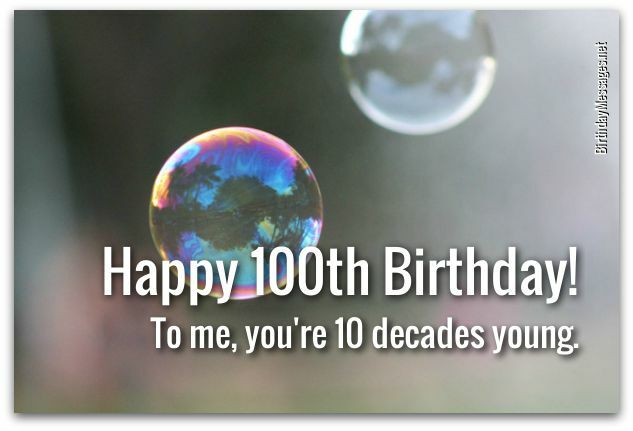 I wish you a 100th birthday as special as you. 100 warm wishes, hugs and kisses on your 100th birthday. You deserve it, so you'll have to sit still when we all give them to you. Happy 100th birthday! May your 100th birthday bring you more than all the joy, wisdom, hope and love you've always given away so freely. Happy 100th birthday! You deserve a standing ovation! You’ve always been a superstar. Now that you're in Act III of your life, we just want you to know you have always had a talent for being so wonderful. We love you. Happy 100th birthday!